"In nice weather we hung the laundry to dry in the courtyard. Otherwise, we hung it in the attic next to Moyre Simkhe's apartment. 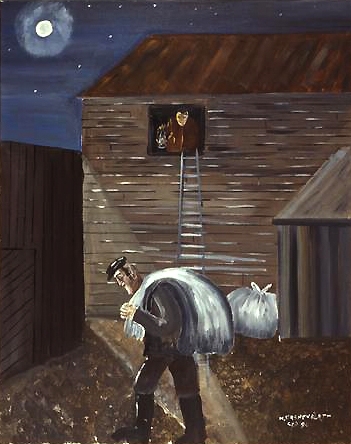 If you were unlucky, thieves would climb the ladder to the attic in the middle of the night and steal the laundry. To get your laundry back, you had to rush over to a particular man who would arrange a pay-off for the return of the stolen goods. You had to be fast, or the thieves would sell the goods to a receiver. Then it would be too late. A middleman knew where to find the thieves: they liked to hang out at the local bootlegger's place, which was called a shvartse shenk in Yiddish. There were several such places in Apt. Bootlegging was an honorable profession; it was like running a private club in your own home. The thieves would gather around a table in the bootlegger's bedroom to discuss the day's business: loan sharking, whose home got broken into, and the like. They knew everything. The lady of the house would roast a goose or a couple of ducks. The aroma of garlic, onions, and roasting fowl is still in my nostrils. It could cost as much as a laborer's weekly pay to get the laundry back; a worker earned a zloty and a half a day. If you paid the money, the next morning you would find the laundry back in the attic. It would be in exactly the same order as the thieves had found it. This was a point of honor among the thieves." Mayer discusses how thieves would steal the laundry from the townsfolk. Listen to it.